When it comes to train tables, children get automatically hooked to them as they find themselves in the driving seat to map their railway track. It is fun and challenging at the same time as they have to build their train world within a given area. But are these tables aid in your kid’s development? It helps the kids to develop their critical thinking prowess and also sharpen their motor skill at the same time. Experts believe that allows the kid to harness their creativity and imagine ability as they are exposed to new things and different working conditions. So won’t you desire your kid to become one of the smartest cats in the bunch? Yes, we guess. For your convenience, we have laid down the names of top best train tables ranging from standard wooden train tables to modern compact tables. So get down the ideal one from this highly curated list. Canyon environment with trains and tracks. Poly construction with fixed construction. Age limit between 3years and 10years. 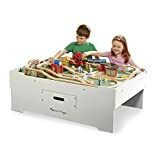 Step2 deluxe canyon train table is a highly reviewed toy train for kids that have brought smile to the face thousands of kids throughout the US. According to reports apart from homes, this toy is quite common in many playschools. Kids love this type of table as it comes with multi-level train track located in the middle of the canyon along with roads. Step2 deluxe canyon train table is a is a blend of all the required amenities like a train track, road and canyon structure which keeps the kids attached to the table for long hours. It is a large 47.6 X 25.6 X 6.7inch table that is made up of premium poly construction which ensures that it lasts for long years despite regular usage. This sturdy children’s train table is based on four sturdy legs which can be removed if your kid wishes to play while sitting. The manufacturer has recommended an age range from 3years to 10years, and it can accommodate up to two children at a time. Step2 deluxe canyon train table is a meticulously designed where the top part boasts a canyon surrounding with deep gorges offering a realistic feeling to the kids. These structure carries road on the surrounding which makes it interesting for the kid. However, the eye-catching part of this table is its multi-level rail tracks that have passed through various sections of the canyon structure. It is a great learning medium for your kid because they learn new things when they traverse the trains across the canyon environment which has bridges, helipad, playground, etc. All these bridges are non-removable, so you won’t have to arrange them every time your little one starts to play with his or her playmate. Step2 has also provided a white lid cover with this deluxe canyon road train and track table which also provides the freedom to use it as a regular activity table. The white lid is resistant to any kind of scratch, and it is quite easy to clean them with any normal cloth. This mountain rock train table can be washed easily if some foods fall on the structure by accident. 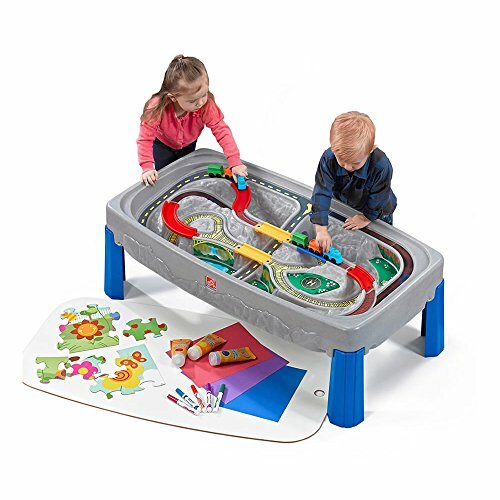 This Step 2 train table comes with only a single three-piece train set, and unfortunately, you will have to buy cars and other objects separately. It weighs around 20.7lbs which might cause difficulty when you try to store them in a corner place. Brawny build quality with high-quality materials. Colorful bridges with fixed construction. It can also be used as a normal activity table. A lot of elements allows the children to learn new things. It only comes with three-piece train. It doesn’t offer tremendous creativity. Thinking of gifting your kid with a new train table which will not only entertain them and also enhance their motor skills, then check out Step2 deluxe canyon train table. Double-sided play board with a wide area. Activities like train set, doll house, block play, puzzle etc. Jumbo pull out drawer for storage. Recommended age: Three years to 8years. Melisa & Doug deluxe wooden train table is a favorite choice for many mothers due to its effective price point and varied type of activities along with train track construction. It is packed with many features which assist your kid in exploring their creativity and enhances critical thinking process thus aiding to their development process. Melisa & Doug deluxe wooden train table is an unconventional all-purpose table whose primary motive is to assist kids in learning new things. It is a broad table that has a dimension of 50 X 32.5 X 16inches and overall weight of 62lbs. It is made out of finest wood which ensures that it lasts for many years despite daily usage. The table offers an ample space for the kid to build a railway system and the base is divided into a double-sided removal panel. However, the eye-catching part of this structure is its massive pull-out drawer where your little one can easily store all the toys. 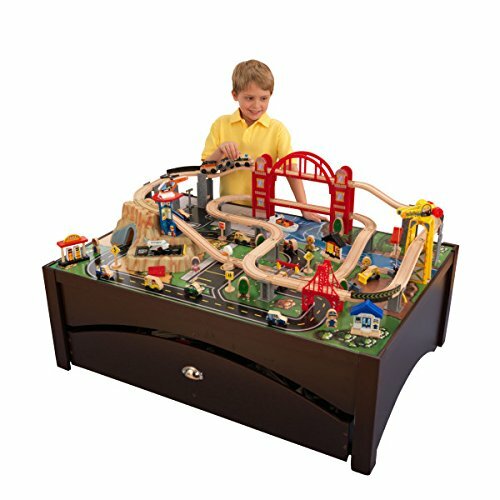 Melisa & Doug deluxe wooden train table is one such sturdy that not only offers space for train activity but also various other activities. Your kid can easily build their train track network and also place railway station, bridge, railway crossing and different other characters which will surely sharpen thinking power. This modern train table will help your kid explore various new things because apart from being a train table set, it also offers a puzzle, dollhouse, block play, and numerous crafts. Their imagination is power is tested because they will build everything by themselves as they are not pre-set on the table. Melisa & Doug deluxe train table is a perfect medium for improving your kid’s social skills because it offers ample space for two kids to enjoy the activity together. However, it is not every kid as the manufacturer has a recommended age limit between 3years and 8years. This train table with storage offers an ideal table height and a decent amount of border which makes this table safe and functional at the same time. If any food spills on the table, you won’t have to worry because you can easily remove the two panel and clean them separately. The dual board is quite easy to clean. 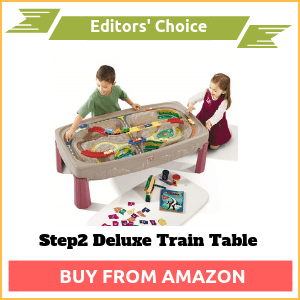 It offers multiple activities including a train table. The body construction is exceptional. The drawer offers a large storage place. It offers an ample space which can accommodate two children. The boundary walls are not that high. If you are looking for study and multiple activity tables that would keep your baby engaged for hours, then look no further and hunt down Melisa & Doug deluxe wooden train table. 120 pieces of toys including a train set. Embedded landscape with roads, playground, and ponds. Sturdy wood table with one 1/2inch lip. Three red bins with a sliding facility. Recommended age: 3years to 10years. KidKraft is a favorite brand in the toy market who has a fleet of many top-selling products, and it includes their famed waterfall mountain train play table. Even though it comes with an affordable price tag but that doesn’t have stopped KidKraft from offering 120 pieces of building ingredients along with a large play space. KidKraft waterfall mountain train table is not an ordinary kid’s activity table rather a meticulously designed play set that will allow the kid to explore new thing. It offers a space slightly larger than usual, and it has an overall measurement of 48.8 X 34.4 X 16inches making it accessible for maximum two children. It is a high-quality, sturdy wood table whose outer border carries one 1/2inch lip which prevents toys from falling down. Even though it is made up of woods, but the corners are adorned with unique T-molded edges that bar your kid from facing cut or scratch. The main aim of the KidKraft waterfall mountain train table aids in your kid’s learning curve by exposing them to new things in the form of train play table. This train set table is based on a flat screened activity board that is crafted with a road, pond, airplane runway, garden and many more. What set this waterfall table apart? It’s 120 pieces of toys which serve as an ingredient for your kid to build their train world using their imaginative power. It will pamper your kid with various colorful toys that include a waterfall, train track, four-piece train set, bridge, railway crossing, helipad, helicopter, cars, fire station, airplane, runway, etc. Constructing train track and other elements in KidKraft waterfall mountain train table won’t be any issues as they get attached by hooks. An advantage of this table is that it gets three brawny plastic bins that can store all the toys and you can store these bins by sliding them under the table. Washing the solid wood track and other plastic toys won’t be an issue as they are easily washable. However this train table is only suitable for kids between the age of 3years and 10years, and it shouldn’t be accessible to kids below 3years as they might choke while biting. It helps the kid to learn new characters and structures. Availability of 120 pieces of toys. It comes with a built-in landscape. The wood and plastic quality is top-notch. The drawers offer large storage option. The laminates start to fade after a few months. Expose your kid to the world of railway system with KidKraft waterfall mountain train table which serves as one big table carrying many learning ingredients. 100 piece of toys with a train set. Two tier bridge, cave, and many other structures. Large storage option with two compartments. Solid wood frame with espresso body finish. Age limit between 3years and 15years. KidKraft Metropolis train table is another toy train table from this famous manufacturer who has been dominating the US toy market for many years. This model has brought a storm in the toy train segment because it is loaded 100 pieces of toys and premium wood frame with espresso finishing. KidKraft Metropolis train table is a big play space that is molded with a metropolitan city theme that has many structures, but the train path takes the limelight. This modern train table offers a gigantic dimension of 46.9 X 32.9 X 26.8inches which justifies its heavy weight of 89lbs. You won’t have to worry about its durability as it is built using top of the line wooden frame with an espresso body finishing thus making it a playroom showpiece. Surprisingly the side of the tables doesn’t come with a lip and corners are not curved which might be injurious to the kid. Once you introduce the KidKraft Metropolis train table to your kid, you won’t be able to take them off the table, and it is mainly because of 100 pieces of toys including the train set. They can build a whole metropolitan theme railway set on the laminated table which contains road, garden, river, police area and many more exciting portrayals. The train set carries a considerable train track length which passes through two bridges, and one of them is two tier where the lower area is designed for the train track. It will assist your child to build a city of their own that has cave, police station, gas station, construction yard, helipad, airplane runway and many more. Experts say the characters, as well as structures on the KidKraft Metropolis train table, is crafted in such a way that it will spark the imagination and critical thinking power your kid. Unlike its counterpart, this model train table gets a massive pull out drawer with two jumbo compartment which is sufficient enough to store all the 100 pieces. If you are two, then you won’t have to worry because they can easily play together in this table which will be useful in the development of their social skill. However, it comes with age barrier between 3years and 15years. Availability of numerous train pieces and other accessories. Broad landscape table with great color detailing. The built quality is mind-blowing with a smooth finish. It serves as an ideal medium for the learning activity. The edges of the tables are slightly prone to injuries. The sides don’t have a lip to prevent falling of toys. KidKraft Metropolis train table can serve as an ideal addition in your kid’s room because they can learn new thing and sharpen their brain which will ultimately help them to become smart. Birch wood structure with a non-toxic top layer. Ample space for the train set. Suitable space for legos, puzzle and block construction. Thick, sturdy stand with ideal height. Suitable for kids above the age limit of 1 year. 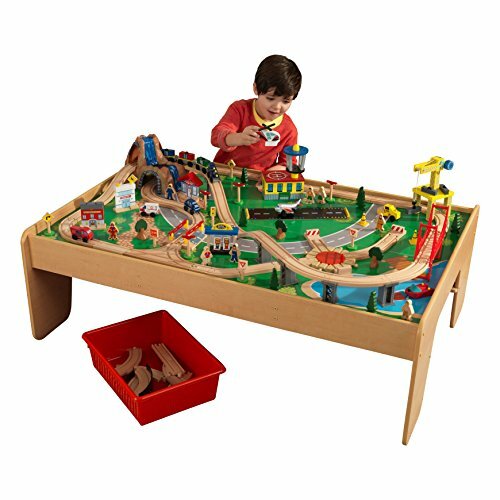 Sodura birch wood train table is a classic toy structure which contains a simple train sets with tables and one big railway yard. 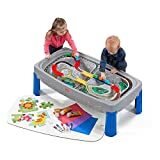 Even though it is a train table with a minimal amount of train play pieces but it can also be used for various other playset constructions as well as normal activity. Sodura birch wood train table is an eccentric looking Lego train table which might look like a regular classic table that offers a medium for train set construction and many other play sets. It is 48 X 36 X 17inch in dimension so you can guess it provide an ample amount of space for your kid to set their play. While playing, if your kid suddenly jumps on the table you need not to worry because it is entirely crafted from birch wood which is famous for its sturdiness and longevity. To offer optimum safety, the manufacturer has polished and curved it suitably which will prevent the kid from any kind of injury. The amount of play pieces your kid will get with Sodura birch wooden train set table is quite minimal, but that minimum amount is sufficient enough to engage for long hours. Your kid gets the chance to cover the whole table with a long track, and for traversing the path, Sodura has given three train sets. What makes it more interesting? This table also comes with railway yard, track signal post and a track converter which assist them to learn how railway network works. It serves as an admirable choice for your kid as they can also play Legos, puzzles, blocks, and various other constructive activities. You can even install a laminated layout on the table to vivid their imagination power. Apart from being a train table, your kid can utilize the Sodura birch wood as a study table, and they won’t have any issue because it comes with an adequate height. The top layer is coated with a non-toxic body finish thus making it absolutely safe for toddlers. The thick legs of this toddler lego table are quite sturdy, and they won’t deform after some month of usage so you can steer away from all your scary thoughts. The premium birch wood offers exceptional longevity. It is totally safe for kid’s health. It offers space for various other activities along with a train set. It can also be used as a standard study or activity table. The body finishing is not that great. If you are looking for a multipurpose premium built quality train table that will also support other activities, then immediately purchase the exclusive Sodura birch wood train table. So, we guess our detailed review will assist you to find the ideal train table for your kid. But apart from these reviews we also like to provide some vital information which will come handy for you. Activity tables are designed in such a way that they offer not only entertainment but also optimum safety. The manufacturers keep kid’s safety as their top priority so they bar themselves from providing a structure which might cause an accident. The paint and body material used in the product are entirely toxic-free, so even if they bite them, they won’t cause any harm to the health. In terms of safety, all the activity table offers proper coverage so you won’t have to worry when your little one use them. 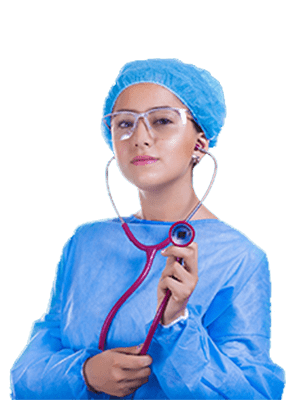 Moreover, the heights and stands of these tables are constructed in such a way that there is minimal chance of any sudden accident. Critical thinking: Without any shadow of a doubt, the critical thinking prowess is significantly improved while they play on the train table. Building the train network using various child train sets pressurize them to solve the problem which ultimately aids to the critical thinking prowess. Moreover, while they set the tracks and other pieces, they evaluate their critical thinking which assists them to make the final judgment regarding the railway path placement. Childhood development: Train tables are recommended by many experts throughout the world because it helps a kid during their development. Their motor skills improve by a large margin as they have to place to different small things at the right place. Along with motor skills, their creativity and imagination power is thoroughly tested, so it helps them to develop their brain. Problem-solving skill: While playing on a train table, your kid gradually develops their problem-solving ability as they face new challenges while connecting track and building toy structures. They find out the best possible path which will offer a continuous motion of the train set. Their development in problem-solving skill will help them to become smart and independent when they go out in the outer world. Social Skill: Your kid’s skill gets a lot of improvement while they play on a train with their playmate. They get to interact with others and learn how to share things while playing. Now, let’s look at all the consideration which will help you make a perfect choice. Quality: At first you should check the quality of the construction as well as the material and always opt for a sturdy wood construction. It would be a smart to choose solid wood with a thick bottom. You can also opt for other materials, but you should make sure they are of proper quality. Safety Feature: As the train table will be used by kids so you should check appropriately whether they are safe for kids. 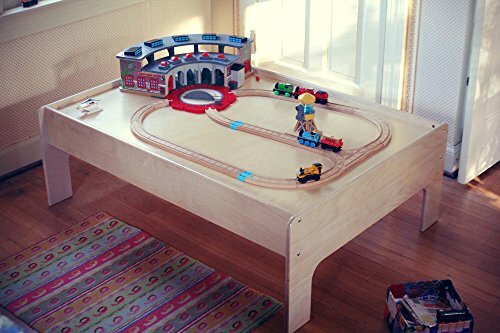 A proper train table which is entirely safe for kids would have adequate height, non-toxic body finish, curved edges, blunt sides, and heavy base legs. Size: Size is another thing that you need to keep in your mind, and if you are purchasing the table for one kid, then a small train tables size would do fine. However, if you have more than one kid or little one often have a playmate, then it would be smart to get a table with a large dimension. You can opt for a full-scale table which would easily cater your kids and their playmates. Toy Pieces: Never opt for a train table with limited options because it would render futile as your kid won’t get impressed by your gift. So always look for a table with a good number of train set pieces and various structures as well as characters. Table Top Design: It is always advisable to opt for a table with an excellent printed landscape as it helps your kid to build their railroad using their imagination. However, you can also choose a plain table without any printing but entirely depends upon your kid.